You might think there would not be a lot to connect the Renault Dauphine 'runabout', and a turbine-powered land speed record car. Part of the reason for the record attempt, though, was to boost sales of the new Renault roadster. Renault recruited race car designer Albert Lory to the Etoile Filante - or 'Shooting Star' - project. He duly incorporated a space-frame chassis, plastic bodywork, massive disc brakes, and torsion bar suspension into the car. But, the Etoile Filante's pièce de résistance came courtesy of Turboméca - the French aero engine manufacturer. They supplied the car's gas turbine motor. It was dubbed the 'Turmo 1'. It was a thirsty bit of kit - needing three fuel tanks to feed it! One of them - forged from synthetic rubber - was placed in the car's nose. Located fractionally fore of the cockpit, it was hardly the safest arrangement! The plucky pilot was test driver Jean Hebert. Putting all 'inflammatory' thoughts out of his mind, he drove the Etoile Filante to 191.2mph. That was enough to topple Rover's turbine-powered tally - and set a new record. The Etoile Filante was a product of 'space mania', which was sweeping Fifties culture. In the USA, especially, anything which smacked of 'rocket-ships' was a surefire hit. Fittingly, then, the Etoile Filante's record-breaking run took place at Bonneville Salt Flats, in Utah. Renault had pushed the envelope, technically. More than a mere marketing stunt, the Etoile Filante taught lessons that would be applied to real-world roadsters. Straight-line stuff it may have been, but there was much for Renault to learn - about acceleration, road-holding and braking. There is no surer test of a car's stability, than a stab at a world land speed record! The Etoile Filante made 270bhp - which had to be safely transferred to the salt flats. Clearly, the car was up to the job - as its successful run showed. 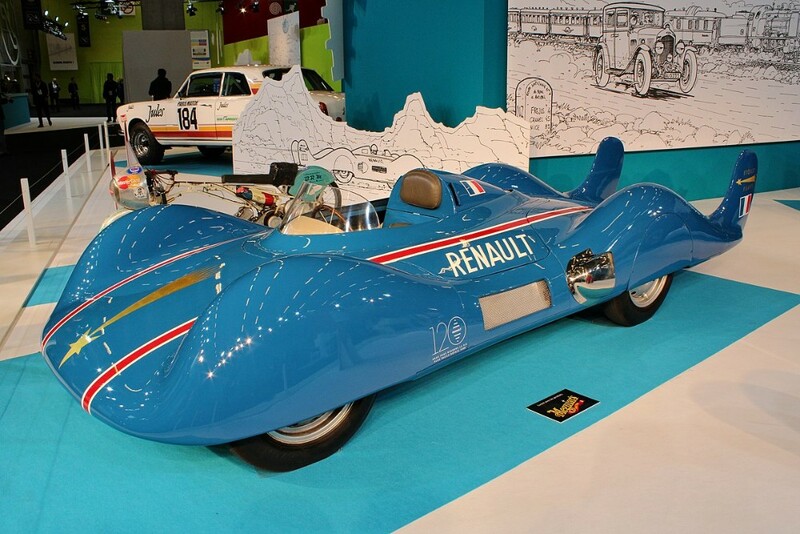 The pride of Paris at the time, the Renault Etoile Filante was a fine example of French forward thinking ... in every sense!